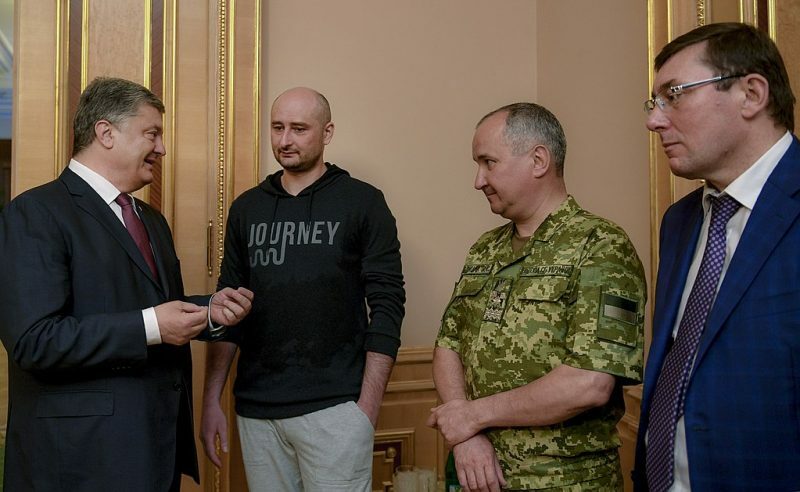 When Russian journalist Arkady Babchenko worked with Ukrainian authorities to fake his own assassination  in May 2018, he became an international story and subject of criticism. This week, he was named a “Person of the Year”  by TIME Magazine. Rather than choosing one newsworthy individual, the US-based magazine chose to honor journalists around the world for their efforts during a particularly trying year. Dubbed “The Guardians and the War on Truth”, this selection included Jamal Khashoggi, the Saudi advisor-turned-journalist who was murdered in the Saudi embassy in Turkey, and the staff of the Capital Gazette  newspaper in the United States, whose colleagues were killed in an attack at their offices earlier this year. Also on the list were two Russians: one, Tatiana Felgengauer, almost died  in a brutal knife attack. The other is Arkady Babchenko, who staged his own death  in cooperation with Ukrainian authorities in May 2018, the hopes of exposing an alleged plot by Russian security services to assassinate Babchenko and 30 other Russian political emigres in Ukraine and other countries. There is still no concrete evidence that the alleged assassination plot actually existed. And many international organizations, including OSCE and Reporters Without Borders, criticized  the stunt as unjustifiable, irresponsible and damaging to public trust in the media in general. Babchenko's inclusion TIME's list was also controversial because of who was not included. Many have pointed to the three Russian journalists who were murdered  in July 2018 while on assignment in the Central African Republic. With this last line, Babchenko seems to be poking fun at himself. He has developed a reputation for soliciting donations for beer money at the end of many of his posts online, including the most vitriolic, something Shtein references in her Tweet above. This reflects his model of independent reporting: he posts content, and asks for money in exchange. He has even spearheaded a “Journalism Without Middlemen ” project to formalize this arrangement. Some also took issue with his inclusion because they allege Babchenko has not done any reporting for quite a while. While he is well-known for his reporting on the Chechen War and writing for Novaya Gazeta, the Russian newspaper holding the dubious record of having the most reporters assassinated while on the job , he has not written much for a few years. The only exceptions are his expletive-filled Facebook posts culminating in donation appeals, something that's been mocked even among many of his former colleagues and friends.